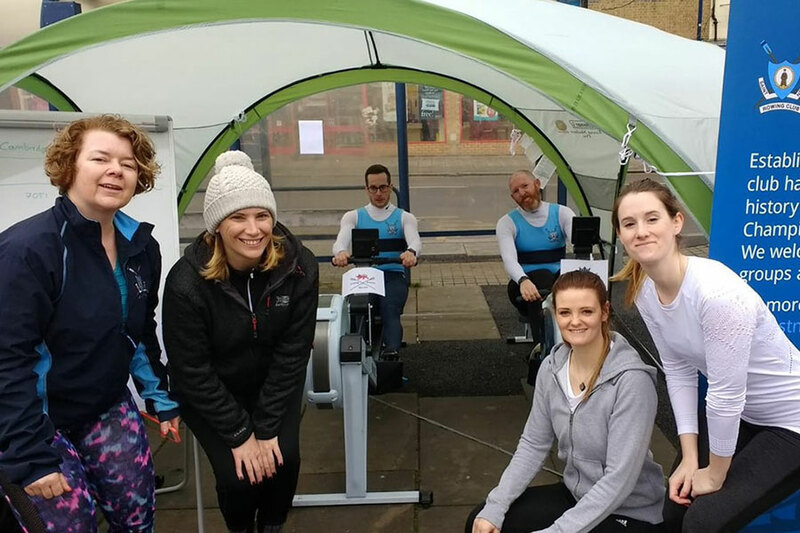 Club members took to St Neots market square on Saturday 24 March to row as far as possible in five hours and raise £1,700 for charity. They were taking part in the Cancer Research Great Row, a nationwide event that challenged people to row the traditional marathon distance – 26.2 miles – during the month of March. They could complete the distance in stages or in one hit, and ask for sponsorship in the process. Our members decided to up the ante by rowing as many marathons as they could during the town’s monthly farmers’ market. They added a competitive element by using two rowing machines to see which could clock up the most miles – one for Cambridge and one for Oxford, in a nod to the Boat Races taking place later that day in London. After five hours of taking it in turns to row in short bursts the group had covered an impressive 87.8 miles – almost three and a half marathons – with the Cambridge ‘boat’ defeating Oxford by just over half a mile, setting the scene for the Light Blues’ clean sweep on the Thames that afternoon. The most important figure of all, though, was the £1,700 they raised for Cancer Research. Club chairman Trevor Rickwood was among those taking part. He said: “We all had tremendous fun and raised a fantastic amount of money for a charity that’s close to many of our hearts. “Our group had a few Cambridge-Oxford split loyalties, and I can’t comment on rumours that I wasn’t trying hard enough when I was on the Oxford rowing machine, but we are all incredibly grateful to everyone who sponsored us.